The size and dimensions had to be perfect; it had to be better than what I’d dealt with in the past and solve some simple problems that kept bothering me. 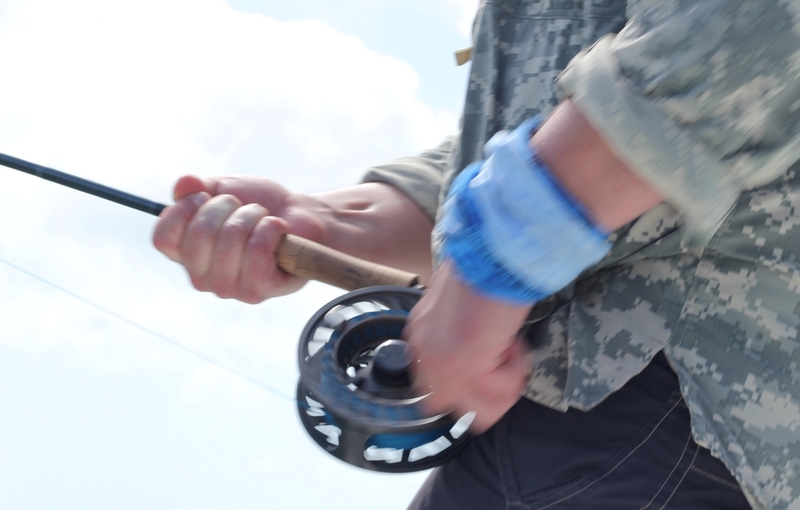 The reel had to be lightweight, but the frame had to be strong to fight the torque of large fish and reeling against them. The finish of the reel had to be the best possible coating that would fight corrosion, scratches, “boat rash,” and such. The color of the reel would be second to strength. Drag – The drag had to be smooth, strong, sealed, maintenance free, and endure a 300-yard run against its highest setting. I wanted configurable spools—different sizes to fit on a single frame so that I could minimize the angler’s cost while expanding the angler’s choices. Cost – I didn’t want another $1,000+ fly reel on the market. There is a balance between spending money on gear and getting to the fish. Ergonomics – Everything from the size of the handle, diameter and width of the frame, and size of the reel foot stanchion would need to balance in a way that casting, stripping, and fighting would not be compromised. Beauty – this comes second to performance in my mind, but this reel would need to be handed down for generations, so the styling would have to hold up just as long. To work out the sizing of the reel, I covered my desk with every reel I could find. I held every reel—inspecting what was good and bad. I took my notes and came up with a dimension that I felt had the best measurement for each width, thickness, diameter, displacement, and tolerance. I am not a CAD engineer, so I drafted everything out “old skool” with a straight edge and a pencil. Frame strength, backing capacity, heft, grace, save weight here…add weight there… Make it perfect. Every reel on showroom floors was coming out in beautiful colors: orange, pink, blue, smoke, silver, green, orange, glossy, matte, clear…. The choices become mind-straining. How do I choose my shoes to match? In the past, a few manufacturers (mostly custom) had brought out a Type 3 anodized reel. Everything else was Type 2, which makes sense with the cost of the Type 3 treatment. You can’t color the Type 3 anodized aluminum either; the level of anodizing wipes out any dye added to the aluminum. Manufacturers told me that the Type 3 reel would be “ugly” and “un-sellable.” But everything I saw looked incredible—like an Abrams tank or something just simply indestructible in this olive/grey, matte finish that seemed to change color in the light. Each reel looked slightly different and had its own personality. I LOVED IT! The Type 3 anodized finish wasn’t about color, though. This anodizing is several times thicker and harder than any Type 2 finish. We add an entirely different process to the aluminum that makes it as scratch-resistant as tool steel. The aluminum becomes non-reactive meaning that it will not create a galvanic reaction (resulting in corrosion) when in the presence of other metals (stainless, etc.) and an alkali (saltwater, etc.). Furthermore, the hardness of the Type 3 coating provides a natural lubrication between surfaces on the reel. It took seven months to finally get the Type 3 anodizing achieved and perfected. When it was finished, I was certain that this was the right direction to go. When the first prototype came through, it was tested on sharks, jacks, tarpon, and the typical laboratory equipment (scales, motorcycles, etc.). While this drag would perform well for just about any fish you could put on it, it wasn’t great. It wasn’t perfect, so I added more drag surface and doubled its strength. I modified the frame to add additional torsional rigidity, and increased the porting to lighten it up a shade. As more prototypes rolled in, more changes came with them—stronger screw here, smoother surface there, taller piece over yonder, and more click, less click, reduce auto-pickup, adjust that…and so on. I tested various backing capacities and began working on the configurable spools. In the past, I had seen reels that were designed starting with the smallest sizes first and then moving up to the larger sizes, based on the small ones. This seemed very backward. To scale up the size and keep componentry the same ends up with the largest reels, the ones most vulnerable to stress, becoming the weakest. I started with the biggest size and made sure that it could hold a 13wt line with over 400 yards of 30-pound, braided Dacron backing. With 420 yards of backing on the spool, the reel lined up perfectly. Taking that frame, I designed a Super Large Arbor spool that would be lighter and hold less backing with 11- or 12-weight lines, or even a 10-weight. There stood the NitrogenXD Kiritimati with 2 spools that would cover everything from a fast-retrieve 10-weight on up to a tuna-weakening 14-weight with enough gel-spun to follow the Bluefin migration. With that, spawned the dimensions of the 5-7wt “Kenai” size reel and the 8-10wt “Abaco” size, both with available spools to broaden the angler’s versatility in switch, spey, and traditional fresh and saltwater applications. The final and perhaps most important part of the development and design phase was to keep the price of these reels lower than the others out there…MUCH lower. I own and fish several reels that I bought before I got married. Let me say that again, these reels were purchased BEFORE I got married. That was also when I bought handguns, motorcycles, took 2-week road trips to fish every river I crossed until I reached the next ocean and probably picked up more than my share of bar tabs. My goal was to keep the biggest sizes around $600 and have the smaller reels fall in below that. Wetfly operates on one of the slimmest margins in the fly industry. We are lightweight (not me), but we keep our expenses as low as possible. That cuts down on some of the advertising, and the bottle of wine at the table might be more of the “Riuniti” variety versus a “Chateau du Gag.” I didn’t cut any corners on the design of the product, but instead made sure that value was brought to the angler—the lowest price possible with the highest quality attainable—The NitrogenXD Fly Reel.